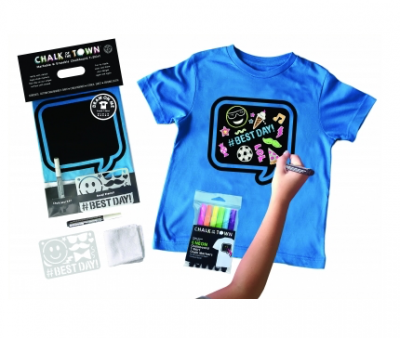 Draw with bright chalk markers on the patented surface to create a t-shirt design. Here is the best part: the chalkboard is erasable! Simply wipe with a wet cloth or launder & the shirt is ready for more personalization. I love that the chalkboard can be erasable. This is a wonderful creative product and I love how it can be personalized.